In the city of Las Vegas, every time you close your eyes the betting machines Jackpot Party becomes more and more famous. These slot games are a legend in the games of this city because no matter how much time passes, from day to years, it seems that its popularity is never enough. It has simple bonus rounds, yet a fury of love and energy flows from its fans located in the United States of America and around the world. The Jackpot Party slot game is a legend it is because it was one of the first to unleash the creativity implemented in the video slot games by adding to the game the so famous nowadays: bonus rounds where most of the prizes that take place are won and taken home by the players. Many designers are taking its inspiration for this game who also have the bonus rounds. It is due to these bonuses that Jackpot Party is still on the track, without losing the race. It also has many more modern versions that support it as a betting machine. 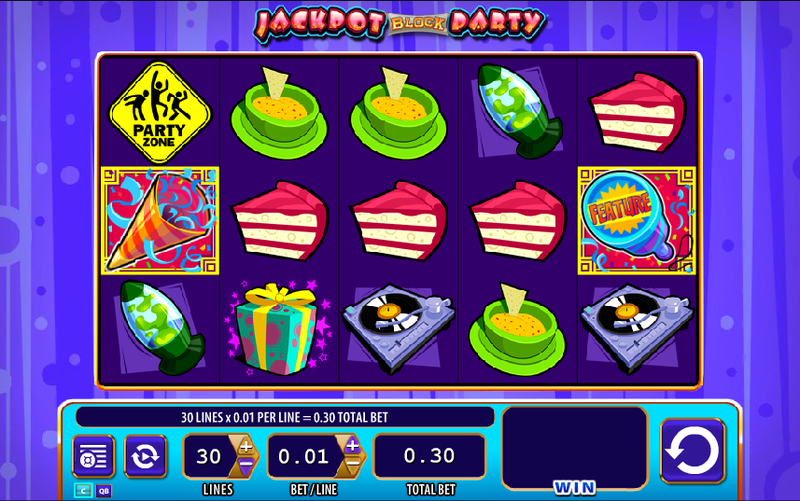 The bonus round offered by a game like Jackpot Party is based on different gifts that are presented on the screen for the player and from there he must make the decision and choose only one. This gift after being chosen opens and whatever it contains: the player will take it without problems, so better than a prize fall and not junk or anything else. Because it is the coincidence that this gift may contain some factor that instead of presenting a prize, ends the bonus round. And there is even the opportunity to get second chances to choose another of the gifts. In the world of Jackpot Party, the players love gifts! At present, the version with which the physical casinos are equipped in Las Vega and other cities is the latest version of Jackpot Party. This new version of the game Jackpot Party is another level of fascinating and modern, players were delighted after its revelation, and this new version brings new features and innovative options to improve the experience, without detracting from the original version. This new version was called Jackpot Block Party, obviously completely linked to the old version but, as it has been said before, it has its own characteristics that make it different and more modern. Nobody can ever resist a party. Do you join Jackpot Party? Jackpot Block Party is a slot game created by the company WMS Gaming that has some colorful party graphics, some thirty lines of bets and a balance of up to a thousand points, where you can get up to ten thousand credits as profit. The maximum bet turns out to be fifteen credits per line, which leads to four hundred and fifty credits as a general maximum bet. If instead, you opt for the free version because obviously, you will not have any real cost to play in free virtual casinos. The game has a party atmosphere where the graphics have some relationship with the parties and fun, quite nice with a menu commonly added in the games that belong to WMS. The sounds effects are also quite sticky and remarkable and even the graphics have sharp and caricatures drawings. This betting game Jackpot Block Party has thirty pay lines, plus five rotating reels and three common rows. The game is completely configurable in case the player seeks to have total control of the game, free for the user to choose from the number of pay lines that he wants to activate up to the size of the bets, this is available in the menu board that is located at the bottom of the screen. In addition to this obviously the game has its respective graphics where the Jackpot Block Party logo is the wild and wild card, which has the power to appear in a total of three times in the number one, number three and number five rolls and so place to the “Block Party” in up to four different party areas. If the game gives place in the lanes to more than three special graphics then the different parties will be activated, which are the Office Party, the Costume Party, the VIP Party and the Players Party, all in different places. Jackpot Block Party if it’s a real party! An interesting fact is that Jackpot Party does not present in its graphics any letter or number in it, which is unusual since the vast majority of the gambling and slot machines themselves possess these additional cards as graphics and in the Most of the cases, these are the graphics with the least value of all. By not having letters as graphics, this leaves room for other more creative and that are consistent with the party theme. The graphics of this slot machine area discs, pieces of cake, a disco ball, a lava lamp, a bowl of nachos, an unusual traffic sign indicating a party area, the wrapped gift and the Jackpot Block Party logo. These have a very wide range of bright colors and extremely bright where highlights different types of blue, purple and others such as yellow, green and orange. All this available on the screen where you can also see the bottom board that reveals important information for the player, such as active pay lines, the number of bets per line that the player decided to place, the total of the bet, there is also a button that serves to restart, a panel of options and a space to reveal the final gain. Go partying and relax for a while with Jackpot Party in all its available versions like the unmatched Jackpot Block Party. These are slot machines that nobody wants to lose and everyone enjoys playing because the parties they offer are super cool and only the best of all players attend their events. In Jackpot Party you get gifts, go to parties and have a great time What else can you expect? You will love the Jackpot Party! Remember that it is playing to have fun and win along the way, and if you are looking for that, Jackpot Party and all its versions are more than welcome to play to spend the best of times playing, dancing and living the best experience. . The Jackpot Party slot game is a legend it is because it was one of the first to unleash the creativity implemented in the video slot games by adding to the game the so famous nowadays: bonus rounds where most of the prizes that take place are won and taken home by the players. Many designers are taking its inspiration for this game who also have the bonus rounds. It is due to these bonuses that Jackpot Party is still on the track, without losing the race. It also has many more modern versions that support it as a betting machine. Among other gifts such as the famous multipliers or if it is the case can take the player to other types of gifts with prizes so fascinating that nobody will ever believe. There is a long and extensive list of online casinos where you can play the Jackpot Party slot machine with real money and cash if you are looking for prizes to take home and not just play for fun. Of course there is also the free version of this game where without having to download an application or make any registration you can play without any problem, these versions have virtual default money that is being spent as you play; If you are playing to the end of this game you can always load the page again and continue with the fun. At present, the version with which the physical casinos are equipped in Las Vega and other cities is the latest version of Jackpot Party. This new version of the game Jackpot Party is another level of fascinating and modern, players were delighted after its revelation, and this new version brings new features and innovative options to improve the experience, without detracting from the original version. This new version was called Jackpot Block Party, obviously completely linked to the old version but, as it has been said before, it has its own characteristics that make it different and more modern. Jackpot Block Party is a slot game created by the company WMS Gaming that has some colorful party graphics, some thirty lines of bets and a balance of up to a thousand points, where you can get up to ten thousand credits as profit. The maximum bet turns out to be fifteen credits per line, which leads to four hundred and fifty credits as a general maximum bet. If instead, you opt for the free version because obviously, you will not have any real cost to play in free virtual casinos. The game has a party atmosphere where the graphics have some relationship with the parties and fun, quite nice with a menu commonly added in the games that belong to WMS. The sounds effects are also quite sticky and remarkable and even the graphics have sharp and caricatures drawings. This betting game Jackpot Block Party has thirty pay lines, plus five rotating reels and three common rows. The game is completely configurable in case the player seeks to have total control of the game, free for the user to choose from the number of pay lines that he wants to activate up to the size of the bets, this is available in the menu board that is located at the bottom of the screen. In addition to this obviously the game has its respective graphics where the Jackpot Block Party logo is the wild and wild card, which has the power to appear in a total of three times in the number one, number three and number five rolls and so place to the “Block Party” in up to four different party areas. If the game gives place in the lanes to more than three special graphics then the different parties will be activated, which are the Office Party, the Costume Party, the VIP Party and the Players Party, all in different places. Jackpot Block Party if it's a real party! An interesting fact is that Jackpot Party does not present in its graphics any letter or number in it, which is unusual since the vast majority of the gambling and slot machines themselves possess these additional cards as graphics and in the Most of the cases, these are the graphics with the least value of all. By not having letters as graphics, this leaves room for other more creative and that are consistent with the party theme. The graphics of this slot machine area discs, pieces of cake, a disco ball, a lava lamp, a bowl of nachos, an unusual traffic sign indicating a party area, the wrapped gift and the Jackpot Block Party logo. These have a very wide range of bright colors and extremely bright where highlights different types of blue, purple and others such as yellow, green and orange. All this available on the screen where you can also see the bottom board that reveals important information for the player, such as active pay lines, the number of bets per line that the player decided to place, the total of the bet, there is also a button that serves to restart, a panel of options and a space to reveal the final gain. Go partying and relax for a while with Jackpot Party in all its available versions like the unmatched Jackpot Block Party. These are slot machines that nobody wants to lose and everyone enjoys playing because the parties they offer are super cool and only the best of all players attend their events. In Jackpot Party you get gifts, go to parties and have a great time What else can you expect? You will love the Jackpot Party! Remember that it is playing to have fun and win along the way, and if you are looking for that, Jackpot Party and all its versions are more than welcome to play to spend the best of times playing, dancing and living the best experience. .